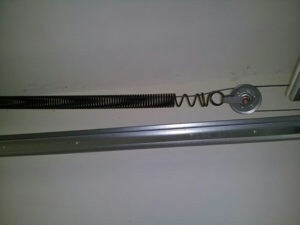 Is Your Garage Door Spring Broken? Torsion springs are by far the most important part of any garage door and consequently they are the leading cause of most garage door repairs. Fatigued or broken springs can even account for garage door opener issues, even though they may seem unrelated can sometimes lead to a door replacement. The sole purpose of the spring system is to counterbalance the entire weight of the garage door, and when done effectively, the door will appear fairly light and balanced. Just remember, a garage door is basically a 200 pound (in some cases even more) steel barrier that rolls up and down vertically. Without the spring system providing a counterbalance, it becomes extremely difficult to lift without additional aids. 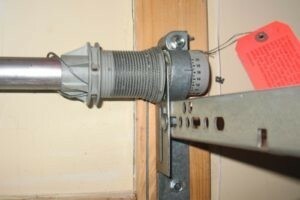 Today, almost all garage door openers have security measures within them to recognize a broken spring on a garage door. They recognize this issue through excessive weight, and they have protocols to stop operation until the springs are replaced. If the opener only raises the door 6-18 inches and then stops, chance are you have a fatigued spring at minimum, but more than likely one is broken. While there are some DIY maintenance components that you may be equipped to deal with, when it comes to your garage door springs, they are not usually one of them. Garage door torsion springs have an extreme amount of tension, and if installed incorrectly, can cause severe damage to you and your garage. Having the knowledge, tools, and appropriate size spring(s) is essential for a safe, correct, long term broken spring repair. Single spring vs. Dual spring? This is a choice some homeowners are unaware they have. A majority of double car, entry level doors or “builder grade” doors, come standard with a single spring torsion system. As you can see in the photo below, there is one large spring on one side of the center bearing plate that is mounted to the header. This is an important choice that should be given to every homeowner, and it is our job to educate you on the decision you have. Torsion springs have a “cycle rating.” A cycle rating is how many times a spring can wind and unwind before it reaches its break point. Think of a spring as a piece of metal getting bent back and forth, over and over again. Eventually the metal will fatigue enough to break, especially when you add extreme amounts of tension. The more “cycles” the longer it takes to reach its break point. Generally, single spring systems are rated around 10,000 cycles. Usage is clearly a major factor on how quickly you decrease your remaining cycles. When it is time to replace this spring, either due to fatigue or if it is already broken, you will have a choice of how to replace it. First choice is somewhat obvious, replace it with another single spring and continue using the door with one spring. Advantage to this choice is the amount of money needed to complete the spring repair will be less. Disadvantages of returning to a single garage door spring: lower cycle rating (will have to replace more frequently), shorter length warranty is given, higher possibility of causing damage to additional parts within the torsion system. Because the single spring is offset, and there is not a second spring to keep the torsion tube centered. As the door is lowered and spring begins to wind up, the single spring will begin shifting the tube in the opposite direction its mounted . Over time this can cause severe damage to either the drum, cables, or end bearing plate. These are costly repairs that can potentially be avoided by having a dual spring system. The second choice, also rather obvious, replace it with a two spring system and immediately begin to receive the advantages of having two garage door springs. The advantages to having a dual spring system: much lower probability of causing damage to additional parts, higher cycle rating (more time in between spring replacements), longer warranty period due to the springs having lengthier longevity. Maybe the most important advantage, the “escape” factor. As we explained earlier, when you have a broken spring, you lose the counterbalance. 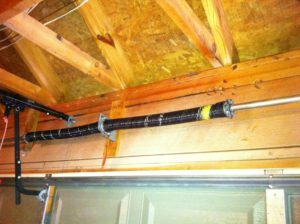 With a broken single torsion spring, most homeowners can not manually lift a 200 pound garage door. Therefore, whatever is in the garage is in a sense trapped until and repair is completed. This generally creates and emergency situation, that some companies will try to exploit financially. Now, if you have two springs and one is broken, you still have that second spring providing some counterbalance. In most situations, homeowners can still raise the door manually and avoid being trapped. You can raise the door in the event of an emergency or if its just to remove your vehicle so you have transportation to get to work, or take kids to school. Of course murphy’s law applies to many broken springs, if there is a worse time for them to break, that’s when it will happen. Expires: Jul 21st, 2019 View Coupon One Coupon per household. Coupons not to be combined. Please present coupon to technician upon arrival.